Edward Schneider (great-grandson of Carl Ingenohl): El Oriente was mostly a trade name, although it did appear in various names of companies of the group associated with Carl Ingenohl’s business group. The parent company was a Swiss partnership of which Ingenohl was the General Partner (and principal partner) and that partnership owned the Hong Kong company, the Manila company (until 1914) and the Antwerp company. 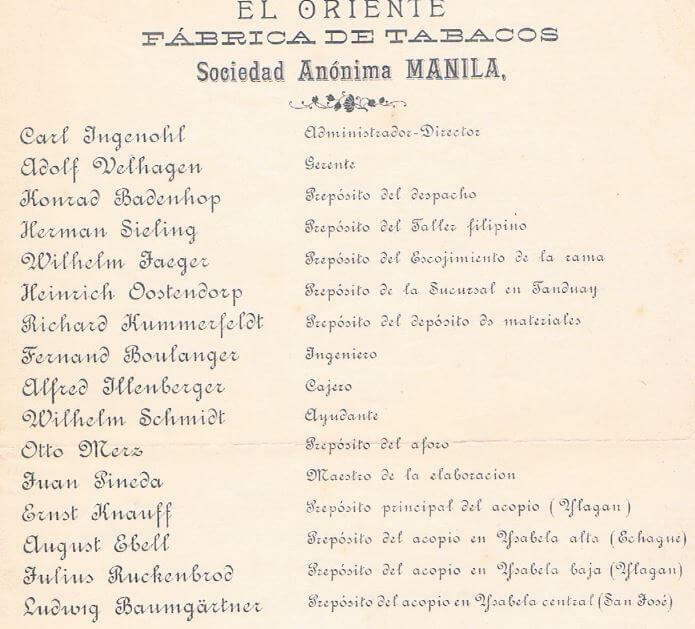 The Spanish name is due the fact that the industrial activity was started by Carl Ingenohl in Manila where the group owned plantations and a factory. I am not quite certain of the date of the the management structure shown below but I believe pre-WW1.